It’s hard times all over. Demonic entities are taking advantage of the slump. It’s a buyer’s market, and the Angels of Evil are scooping up all the souls they can handle. Desperation is in the air. People are trading their eternal souls for pennies on the dollar. In this economy, humans are even willing to forget asking for metaphysical abilities, like spouting flames from their fingertips, predicting the future, and having complete power over all beings. Live it up, crazy humans. You better take that demonic money and invest. Your days on Easy Street are numbered. Soon, the minions of the underworld will come calling to collect their merchandise (your soul). And you’ll be in charge of ferrying lost spirits across the River Styx for about the next Million-Bazillion years. 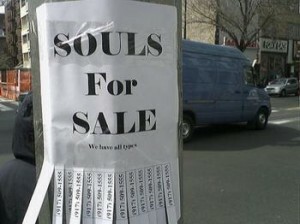 angels, desperation, Future, money, Monster, Religion and Spirituality, selling souls, Soul, soul for sale, Spiritual Beings.